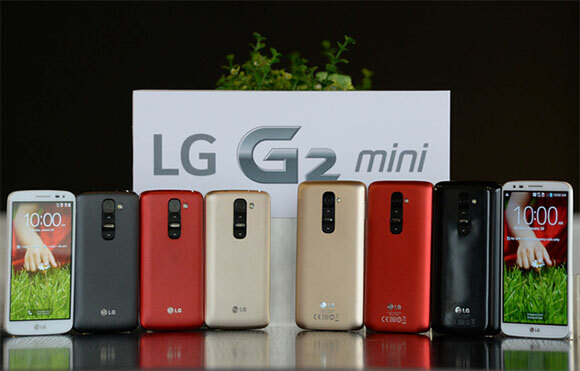 Following a teaser by LG to create a sense of excitement for their upcoming announcement of the LG G2 Mini on its Facebook page, the company has officially announced the device which will be unveiled on February 24th – the first day of Mobile World Congress. Whilst the device was not supposed to be announced apparently until MWC, LG Netherlands went ahead and released the details of the LG G2 Mini early. Multiple versions of the LG G2 Mini? There’ll be two versions of the LG G2 Mini – a version with a Snapdragon 400 chipset or an Nvidia Tegra 4i chipset. Both devices will feature a 1.2Ghz quad-core CPU and 1GB of RAM. There will also be Non-LTE versions of the handset, as well as dual-SIM devices. That’s a whole lot of variations on the same device! The LG G2 Mini will be available in black, red, white, and champagne. The physicals of the LG G2 Mini look familiar to its bigger brother with the rear keeping the controversial button placement, 8-Megapixel camera, and LED flash. It will also house a 2440mAh battery and microSD card slot with 8GB of internal onboard storage. The LG G2 Mini has a 4.7-inch qHD display running at a resolution of 540 x 960 pixels, so unfortunately no 720p, and will also come with 4.4 KitKat, which is good news for LG given the recent announcement from Google regarding the signing window for older versions of the Android Operating System wishing to hook into their services. Interestingly, it will be Russia which gets the device first which LG says will begin the rollout in March. The Middle East, Latin America, Asia and Europe will follow in April. Whilst the device won’t break any benchmarks, and probably isn’t the most exciting device in the world, it does give a pricepoint for those who cannot stretch or don’t want a premium device like the LG G2.